Like most Sundays, this morning I was up bright and early to get to the allotment, do what needed to be done, then get back to the garden to plant out my Cosmos bipinnatus. At the allotment gate, I always check out the noticeboard to catch-up on the latest news. ‘Charlie from plot 56B is selling courgette seed’. ‘Sue on the plot 101a has found a roaming chicken and wonders if anyone has left their coup open?’ And of course an ad for the ultimate prize, where allotmenteers go head to head in the annual pumpkin-growing competition. Hardly big news in the great scheme of things, but it’s life and it warms me to know people care in this way. However, this weekend, our garden of Eden, my one place of refuge, was turned on its head. 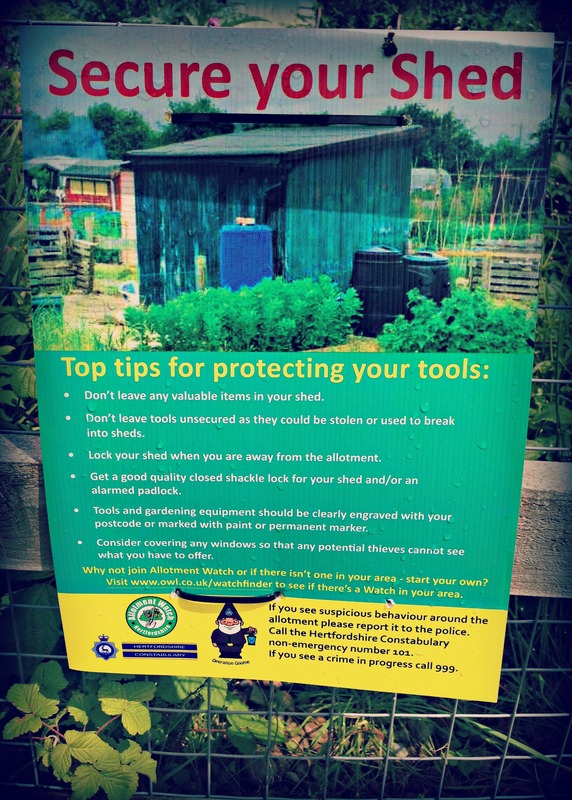 Alongside these notices was a long letter from the allotment supervisor explaining that a few days ago, one of the allotment sheds was broken into and a rotovator was stolen. These days, we are continually bombarded with horrific stories of terrorism, starvation and corporate greed. As a man who’s been around a bit, it’s fair to say I too, on occasion, have witnessed the darker side of individuals and their unscrupulous behaviour. So on the scale of things, a ransacked shed shouldn’t haven’t hung above me like a grey cloud all morning, but it did, and I began to question why. For decades, allotment holders up and down the land have worked hard to create a unique place where they can go, a piece of land to call their own for a minimal cost. Those who can’t afford houses with gardens can come here with their families and grow their own food. Allotment gardening can improve social skills and our relationship with nature. We learn to grow, both on the land and as a person. We know gardening has so many social and health benefits, in recent years the media has high-lighted its positive effects in both therapy and rehabilitation. Gardening is a medicine that costs very little, but has huge rewards. And, as Agent Sophie has written before, in a time of cutbacks and food banks, allotment gardening is such a glaringly obvious solution, yet it’s future hangs precariously in the balance. Whether you’re tilling land in a plot beside a railtrack or sowing seeds on a disused industrial estate, allotments today are facing tough challenges and are awaiting decisions that could have monumental consequences for future generations. From the Save Farm Terrace and the Coombe Allotment campaigns to the crusade to save the Blue Finger land in Bristol (led by Sara Venn), these threats are becoming an ever more frequent blot on our slowly decreasing landscape. So when I read on a little noticeboard of a minor theft, well, it’s like the allotment is being kicked from all sides. It doesn’t matter how big or how little the theft was, a gardener has been robbed. Again. But, and there’s always a but with me, my glass is half-filled and raised. Why? Because I believe there are good people out there. People who stand-up to these haters and fight the good fight. Whether it’s due to jealousy, insecurity or greed, these people will never find peace or fulfilment, they will always want what they haven’t got. Believe me, I’m not wearing a cheesecloth shirt and smoking a crack pipe in a meadow somewhere, but I will say this. Look after your fellow gardener, and they’ll do the same by you. 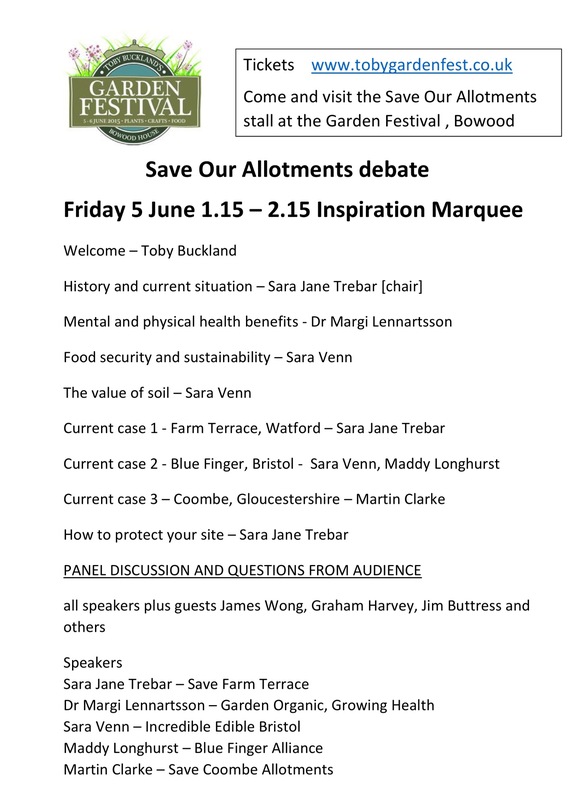 Also, if you have the opportunity, try to get yourself along to Toby Buckland’s Garden Festival at Bowood House this Friday 5th June, where different allotment groups will be getting together for the very first time to discuss the future of allotments. Hear, hear! I live in Maine, a state with a lot of land, but I certainly understand what it must be like for city dwellers who can’t afford a place with land.